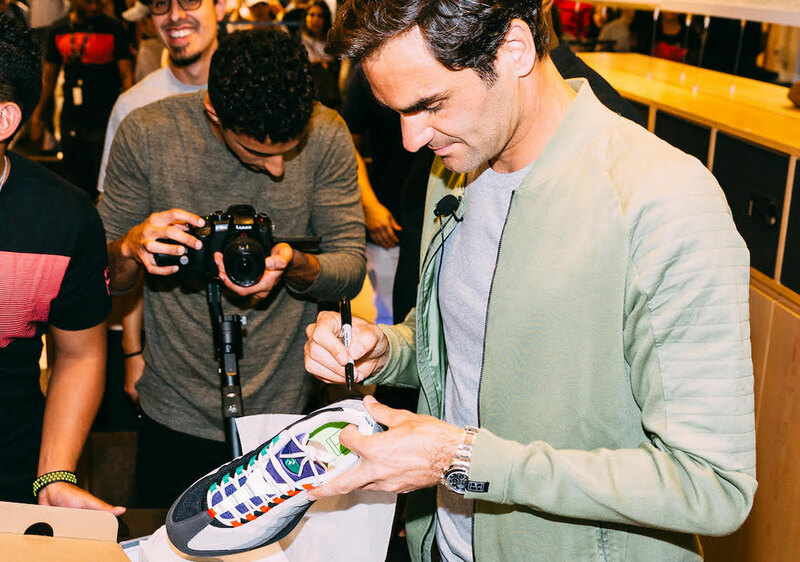 Last night, Roger Federer showed up at Nike Miami to help roll out his newest collaborative effort with the Swoosh – the NikeCourt Vapor RF x Air Max 95 “Greedy”. A capacity crowd was on hand to watch Fed and Miami-based DJ Irie talk sneakers in front of a massive display that highlights some of the 20-time major champion’s favorite Swoosh Brand sneakers. Roger was introduced to some of the most notable members of the Miami sneaker community, and was gifted a personal painting done by MADSTEEZ that paid homage to Fed and Switzerland. Finally, the night finished off with Federer helping some lucky patrons check out after waiting on line to earn the right to purchase the NikeCourt Vapor RF x Air Max 95 “Greedy” at retail. Grab a look at some of the highlights from the event below and tell us if you picked up a pair.